By James Slater: Comeback fever must be in the air; only some fighters are able to resist the irresistible temptation. Right now, we have the very real possibility of former 140-pound king and Manchester, U.K legend Ricky Hatton lacing ‘em up again (even Boxing News, the prestigious trade paper and Boxing Bible in the U.K has Hatton, and his will he won’t he comeback, as a front cover story this week), and Oscar De La Hoya has just revealed to ESPNNewYork that he came oh, so close to coming back himself, this October. De La Hoya, aged 39 and, like Hatton inactive since being badly and comprehensively beaten by Manny Pacquiao, said he “thinks about coming back every singe day,” and that he began training for a planned rematch with current WBA middleweight champ Felix Sturm, the man he controversially out-pointed over 12-rounds to win the WBO 160-pound belt back in 2004. Oscar had hoped to push his body through one last training camp and fight Sturm this coming October 20th – as the headline to the Brooklyn card that will instead be topped by Danny Garcia-Erik Morales II. So, if the former multi-weight king (from super-featherweight all the way up to middleweight) had felt good in his secret training sessions, maybe we would now be reading some blockbuster news of a Golden Boy comeback. Instead, Oscar now says he is “one million percent” sure he is finished as a fighter; leaving the likes of Hatton to inspire the shock comeback headlines (unless Hatton, like De La Hoya, feels his age, either in hard training or in sparring in particular). 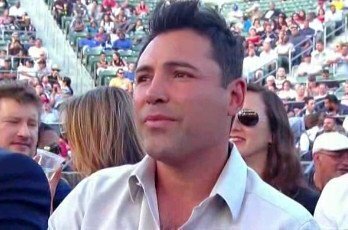 There is no doubt though, that had he come back, De La Hoya would have attracted a huge T.V audience worldwide. And, in facing Sturm again, Oscar would have had a chance to remove the stigma of that close, some say wholly undeserved, unanimous decision victory. But Oscar is both smart and not in need of money. The same can be said of Hatton, but his comeback is still expected to get off the ground. Imagine how crazy it would have been if both Hatton AND De La Hoya announced they were coming back! The rumour mill would have been going at full steam with De La Hoya Vs. Hatton super-fight talk. Sanity has prevailed, however (at least in the case of Oscar). “I can’t do it, I can’t do it,” the living legend said. But Hatton may well be able to do it. Time will tell.